Scientists with even passing knowledge of plant biology are generally quick to recognize the foremost model plant species, Arabidopsis thaliana – a modest weed in the mustard family that goes by the common names thale-crest or mouse-ear crest. With a six-week seed-to-seed life cycle and an unusually compact genome, Arabidopsis is regarded as the best “lab rat” for plant biology. I’m dating myself, but the genome sequence of Arabidopsis was completed in 2000, while I was in graduate school. Thus, my thesis research spanned a period when you had to identify a gene of interest by old-school genetic crossing (weeks…months….years until you could confirm which gene you were working with), and a period when you could plug a bit of approximate DNA sequence into a computer database to much more rapidly identify your gene. By the time I was a postdoc it was possible to stumble upon or hypothesize about a gene you were interested in, order a mutant from the stock center, and examine its expression pattern under dozens of different conditions – all within a few mouse clicks. And these are but a few examples of the tremendous resources available. 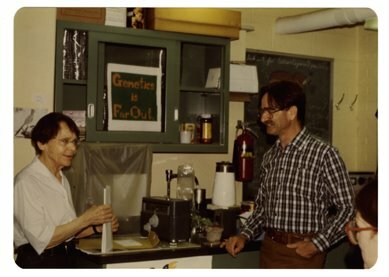 None of this would have happened had it not been for a professor named George Rédei, who brought some Arabidopsis seeds from Hungary when he began his career at the University of Missouri in Columbia in 1957. Rédei realized that the species held tremendous promise as a genetic model for plants, but labored for nearly 20 years before others in the plant biology community recognized the true potential of the species. Rédei died on Monday, 11/10/2008 at the age of 87. I did not know him personally, but thought it would be fitting to add some material to the sparse Wikipedia entry on him. This was my first foray into Wikipedia editing, and while I was able to update the text, I was gnashing my teeth after about 45 minutes of attempting to upload an image of George Rédei and Nobel prizewinning maize geneticist Barbara McClintock (the photo was taken in 1978 and is publicly available through the National Library of Medicine). Turns out that new Wikipedia users cannot upload images until their accounts are at least 4 days old and they’ve made 10 edits. Guess I’ll be attempting this next week. At least this got me started on learning the ins and outs of Wikipedia page creation and editing. Rédei’s life and research are testament to the value of scholarly perseverance. Genetics, agriculture, plant biotechnology, and humanity at large are all the better for his dedication and careful studies.